In this module, you learned about fiscal policy and the power that government has to adjust government spending and taxes to stimulate or slow down the economy. First, you learned that the federal government spends most of its budget in a small number of areas, including national defense, social security, social welfare programs, healthcare, and interest on the federal debt. Most federal tax revenue comes from individuals’ income, though some comes from corporate profits. State and local governments spend the majority of their budgets on education and transportation, while their tax revenue comes primarily from property and sales taxes. Some states don’t even have an income tax. Approaches to fiscal policy vary. Keynesians favor an activist fiscal policy. 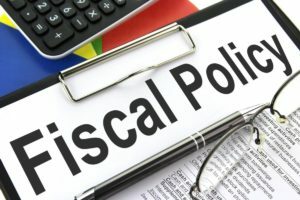 Congress can intentionally try to stimulate the economy using expansionary fiscal policy by either cutting taxes or increasing government spending. Congress can also try to slow the economy down if is overheating by using contractionary fiscal policy, either by increasing taxes or cutting on spending. Neoclassical economicsts prefer a more passive fiscal policy with low tax rates to promote economic growth. We will develop a more sophisticated understanding of fiscal policy in a future module, but first we need to learn about monetary policy.